Get ready to set your goals + intentions for 2018! Be sure to download your FREE Printable below! TODAY is the FIRST video of THREE, and she has A LOT to share with you. Get ready to set goals + intentions! 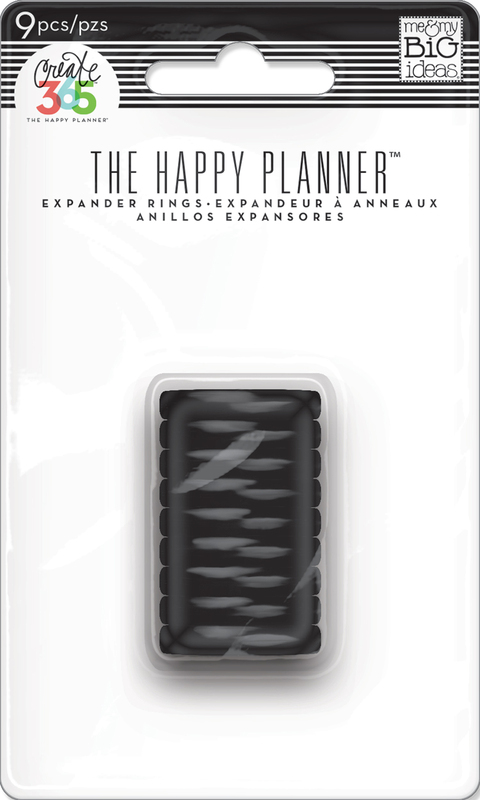 Head over to our Happy Planner® YouTube Channel to check it out! You don’t want to miss out on all the HAPPY! But just one little request from @stephanie_fleming // Use the hashtag #goalgetter2018 so we can SUPPORT + ENCOURAGE each other as we set our minds & intentions on making 2018 the BEST year ever! Live Creatively® + Plan a Happy Life™! H A P P Y mind, H A P P Y life! It’s the first week of JUNE and we are so excited that the Summer season it right around the corner! So why not jump right in?! It’s important to put YOU first - mind, body and soul! We are embracing all things Happy Planner® and not only challenging YOU, but ourselves to live and PLAN a Happy Life™. Join us in the challenge! Staring tomorrow (Wednesday, June 7th) we are planning to be HAPPY FROM THE INSIDE OUT. So head over to the Happy Planner® Instagram (@the_happy_planner) to make sure you’re following and playing along, and don’t forget to bring a friend! Make sure to download the attached printable with the IG challenge calendar, and punch it right into your Happy Planner®. 2. Download your FREE printable - IG Challenge Calendar! 3. Start planning and share with your friends! 7. BE HAPPY FROM THE INSIDE OUT! And don’t forget… Live Creatively® and Plan a Happy Life™! WOO HOO! 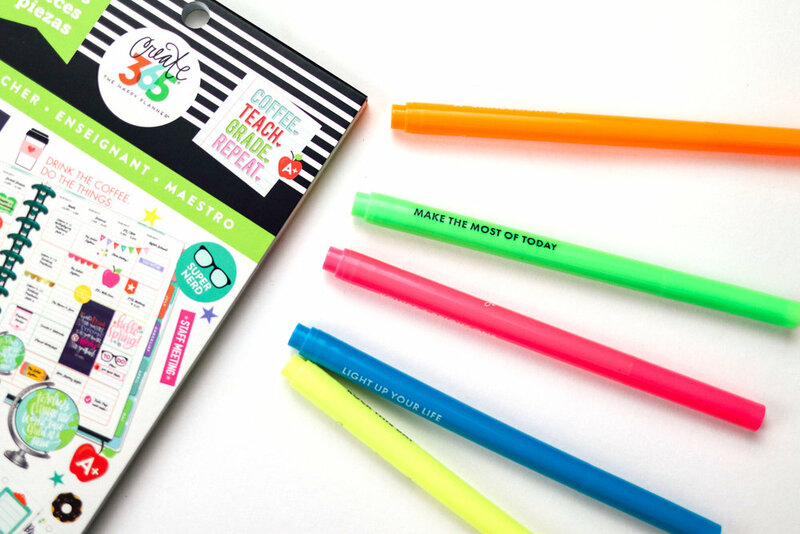 Our new 'Back to School' products are HERE! You planner babes have been asking, and this post is where you'll find your answers! 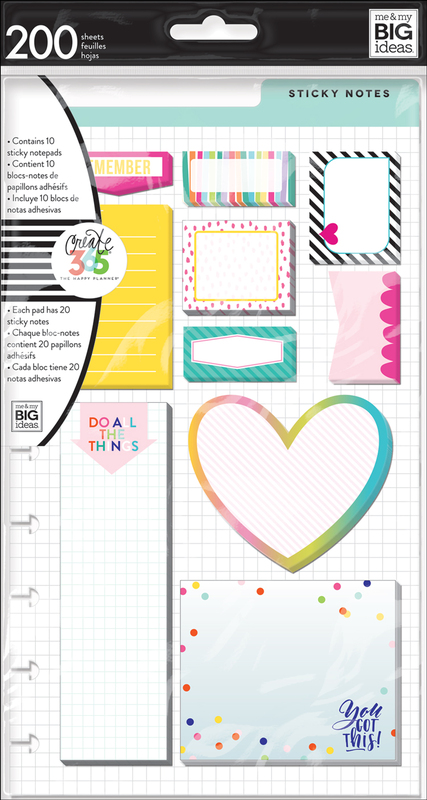 A new BIG Happy Planner® Teacher Planner, new Student Edition planners, new stickers, sticky notes, anymore are a part of this set - something for every planner babe! Below is the INSTAGRAM LIVE video from last week of Stephanie and Lauren talking about the set. Flip through images of the set below. & use them to help you plan a happy life™! Design Team member Mariel Reyes (IG | blog) LOVES her sticker value packs - but inevitably - there will be some stickers that don’t apply to her or something she just doesn't track in her planner. That's when a light bulb went off in her head, and she realized: just because something is meant to be used one way, doesn’t mean she HAS to use it that way. ...and this is especially true with stickers! 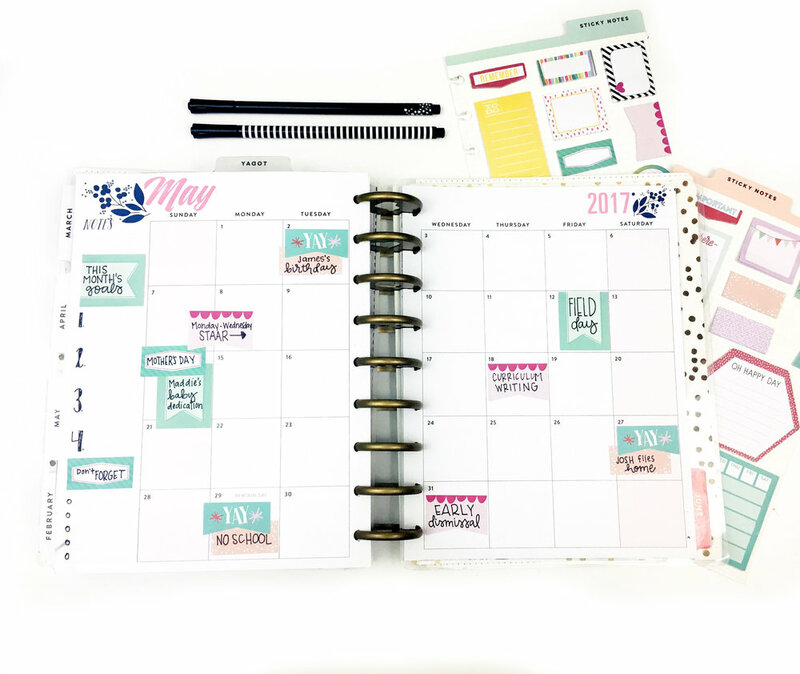 Mariel started looking through her sticker packs and came up with some creative ways to use popular Happy Planner® stickers that better suited her schedule and needs. 1. I don’t really do 'girls night in' or track my meals with dinner stickers from the 'Work It Out' sticker value pack, so I decided to combine the two! I covered the word ‘in' and now it is a sticker I use for going out to eat with my girlfriends! I just put the restaurant in the space for dinner. 2. I wasn’t using the practice stickers from the 'Mom Life' sticker value pack for my kids, so I decided to use them for myself! If there is anything you need to remember to practice, use it! It could be lettering, or even patience! LOL! Either way it is a great reminder. 3. For those that don’t work or are students, you can use the work stickers to mark homework. I just added some alpha stickers. 4. The bibles from the 'Faith' sticker value pack can double as books for reading or Book Club Meetings. 5. I combined the STEPS sticker from the 'Fitness' pack with the 'DR. APPT' sticker form the 'Mom Life' pack to have a custom sticker to add the time of my appointment. 6. I used the HYDRATE sticker from the 'Fitness' sticker value pack to chart the rain! 7. Since my kids no longer have playdates, I used this sticker from the 'Mom Life' pack along with the heart and NIGHT I cut off of the MOVIE NIGHT sticker to make a cute Date Night sticker. 8. Remember the MOVIE sticker I just cut? I used that and some popcorn to mark a matinee! We typically go to the movie in the afternoon, so this works perfect. 9. I used the TIME TO GRADE from the 'Teacher' sticker value pack and cut off the grade and added it as an accent to a quote. It can also be the header of a to do list. 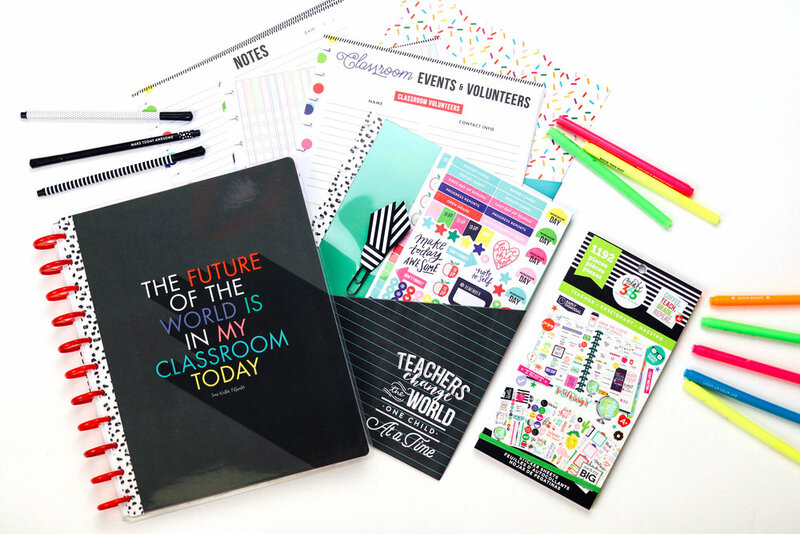 The possibilities with our sticker value packs and Happy Planner® system are endless! 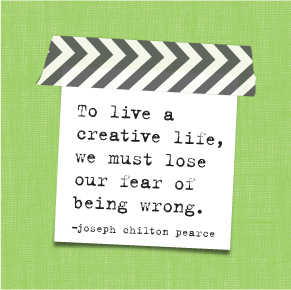 We hope you've been inspired, and we can't wait to see how you continue to live creatively™ & plan a happy life™! 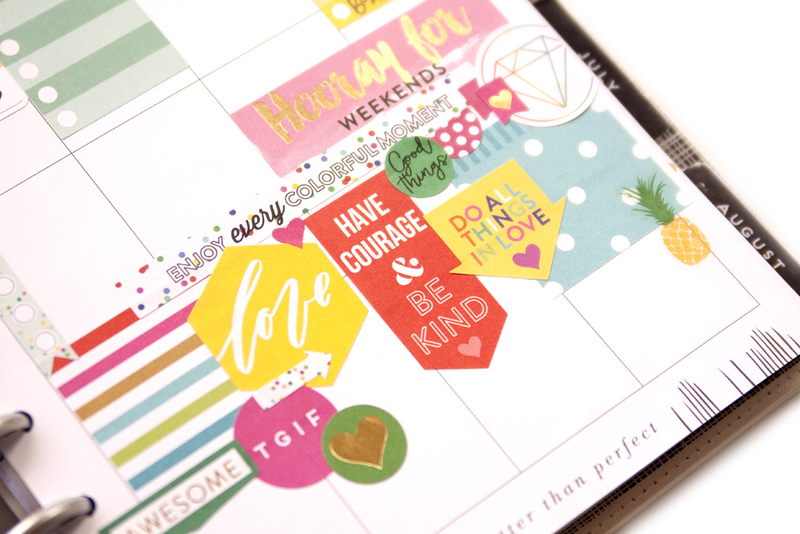 Whether you are completing fully functional layouts or memory planning layouts on the pages of your Happy Planner®, layering a cluster of stickers is an easy way to add color, interest, and an element of fun! Imagine our surprise when two of our veteran Design Team members submitted projects using this very same technique! Design Team member Jennie McGarvey (IG | YouTube) created a horizontal sticker cluster across two pages on her functional, Frankenplanned spread, while Design Team member Jen Randall (@sadieinspired) adorned the weekend with layered circle-cropped photos and circle stickers in her memory planner. "I was running low on certain stickers in a couple of my favorite Happy Planner® sticker value packs, and thought 'What to do, what to do?' This was the main inspiration for my planning this week! Why not take leftover stickers I might not have a specific purpose for - and other decorative stickers that I wouldn't reach for - and put them together, in a layered cluster, as decoration for the week? This decorative strip across the page adds a ton of interest and color, and worked well with my plans for the week. Add in my Frankenplanning (one page from the 'Hello 2017' Seasonal Happy Planner® + one page from my 'This Is Your Year' Happy Planner®) and this is a unique week that is sure to be duplicated in the future!" "Documenting 2017 in my BIG Happy Planner® is my favorite creative project. I LOVE it! All the fun accessories, stickers and tools make it so fun and rewarding each week. I have been using the Happy Planner® system since January 2016, so finding ways to stay motivated is really important. I like to keep my layouts each week similar (helps with the creative work flow for me). But, at the same time I want to find new ways to keep it fresh. One way to do that is to find a shape or color as a jumping off point. For me, this week it was two things - THE circle and gorgeous navy blue washi. When I began this week, I was searching through my bin of washi hoping to find some source of inspiration. Then I saw it! I spotted that beautiful floral washi with navy blue (always a color crush) and knew I wanted to use it. Although I LOVE navy blue, I don't always reach for it. I tend to gravitate to soft colors or neutrals. But, I was IN LOVE so I grabbed it and before I could think too long about it, I threw it down on the page. Just a bit along the bottom was all I needed to continue with stickers from the 'Color Story' Sticker Value Pack. Let's talk circles. I love them. Do you? Using circles is pretty common in the various projects I work on. Also, as I look through past weeks in my Happy Planner® circles are common. But, on this particular week, as I was printing out my pictures, the small photo of the cupcake caught my interest. Naturally, right - it's a cupcake! I wasn't planning on creating a cluster of circles on the right hand side when I started, but the shape of the cupcake inspired me! 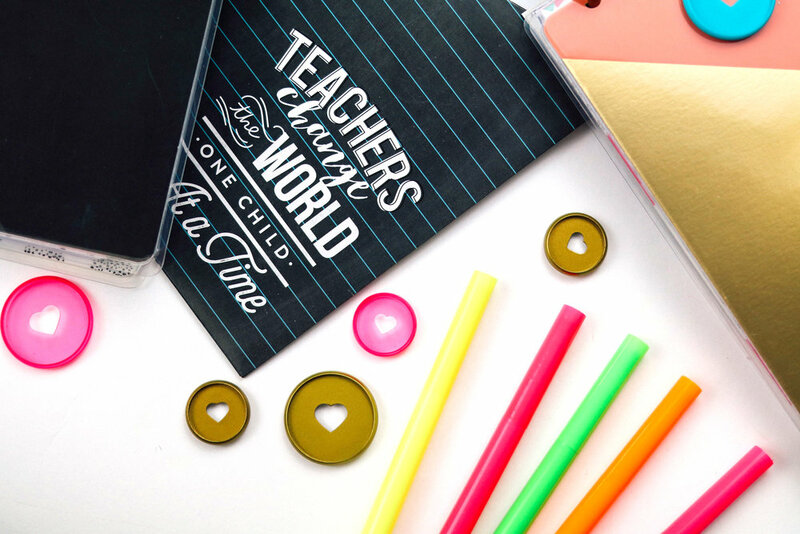 There were SO many circular stickers in The Happy Planner® line to play with too. It was really fun to create and I think it turned out great." Shop some supplies Jennie & Jen used by clicking on the items below. Happy Planner® FAQ : "Where do you get your inspiration from?" If you've been a member of the planner community for a while, and share your planner spreads on social media, you've probably been asked a few questions on your process and your style. Today mambi Design Team member Gretchen Klobucar (IG | blog) is answering a question about her weekly spreads that she is frequently asked: "Where do you get your inspiration from?" "I'm frequently asked where I find my inspiration. Sometimes it's a particular color scheme, a feeling that week, or even just a single sticker. I fell in love with the 'Drink the Coffee. Do the Things' sticker from the QUOTES sticker value pack. I knew I wanted to build my spread around the color and style of that sticker because it's so consistent with my style. I wanted to use red, light blue/teal, and black. I especially wanted the gorgeous black/white flecked print to be throughout the page." "Still, this had to be a fully functional week in my CLASSIC 'This is Your Year' Happy Planner®. I used the notes section to prep for this week's dinners. I also used it to code my strength exercises for the week, using small star icons for 'abs' and 'legs' in the weekly boxes. I've had an awesome weekend ahead, so I prepped my Sunday #beforethepen to give me plenty of space for a packing list since I won't have any tasks to complete - just places to go! It's bright but still very chic." 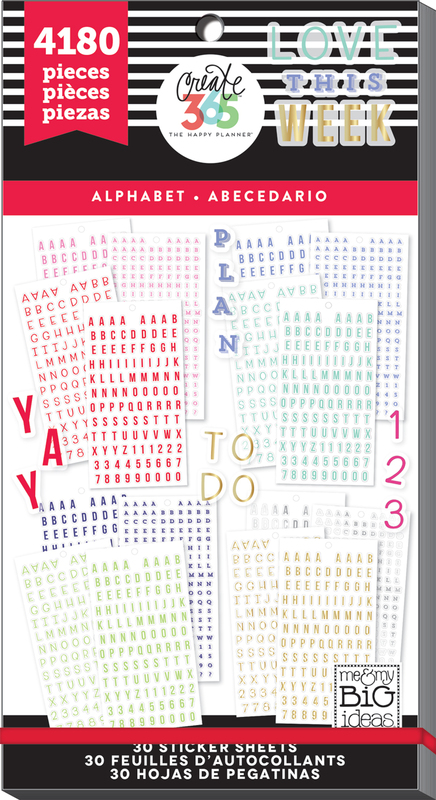 "For this project I wanted to plan out my fitness week in one of the MINI Happy Planners®. I do really like the Fitness Mini Planner that is specifically designed for keeping track of your healthy lifestyle. But, I always like to try different things in my planners & with ALL the different styles, there is plenty to choose from! My goal was to use one MINI Happy Planner® and just mainly the sticker value pack called 'Work it Out'. This makes keeping track of my health goals quick and easy!" "With almost 1500 stickers to choose from in the 'Work It Out' fitness-themed clicker value pack, choosing a collection of colors to work with first helps narrow down my choices. I didn't want to spend too much time thumbing through pages trying to find the stickers to use. Sticking to a particular a color scheme really helps my process. I chose 2 or 3 colors and then use black to balance it out. I love how it turned out and look forward to planning more fitness weeks throughout spring!" Shop the supplies Jen used by clicking on the items below. Our Happy Planner® sticky notes are getting cuter and cuter, and we all could agree that they are too cute to discard once they've served their purpose. Take a cue from mambi Design Team member Heather Kell (IG | blog | YouTube) with today's project, and try decorating a whole spread in your Happy Planner® with sticky notes by adhering them permantently down on the page. "I've always used Happy Planner® sticky notes to pre-plan my monthly spreads. Whenever I learn of upcoming events or activities, it goes on a sticky note and on the future monthly spread. I can't commit to writing it in ink until I know for sure it's going to happen. For May, however, I decided to challenge myself in a new way - I decided not only to use Happy Planner® sticky notes to pre-plan my month, but to DECORATE my monthly spread! The new sticky notes are just too cute to just be thrown away, so I decided to use them almost like stickers. I used them to notate all important events or birthdays for the month of May. I used a tape runner to help stick down any that wouldn't stay put! I love how it turned out."